Total area: 16,192 Sq. kms. The first Catholic priests ever to come to Assam were Fr Cacella, sj, and Fr Cabral, sj. They were on their way to Tibet, in the year 1626. After 1826 when Assam became part of the British Empire, the growth of Tea plantations brought in Catholic immigrants from Bihar and Bengal. In 1850 Assam was united to Lhasa and Fr Krick of the Foreign Church work of Paris was the first Catholic Father to set foot in Dibrugarh on September 7, 1851. Frs Krick and Bourry were killed in February in 1854 in Arunachal Pradesh as they were on their way to Tibet. In 1860 Fr Mercier is said to have visited Dibrugarh. In 1870 Assam became part of the Prefecture Apostolic of Krishnagar. Fr Jacob Broy of the Foreign Church work of Milan was the first resident priest of Assam with headquarters at Guwahati and he looked after Dibrugarh. In 1889 the Prefecture Apostolic of Assam was created with headquarters in Shillong and Fr Rudolf Fontaine, a Germany Salvatorian, opened the Dibrugarh Church work in 1908. With the outbreak of the First World War in 1914, the German Salvatorians were forced to return to their country and the Jesuits of Calcutta looked after Assam. In 1921 the Prefecture of Assam was entrusted to the Salesians of Don Bosco. 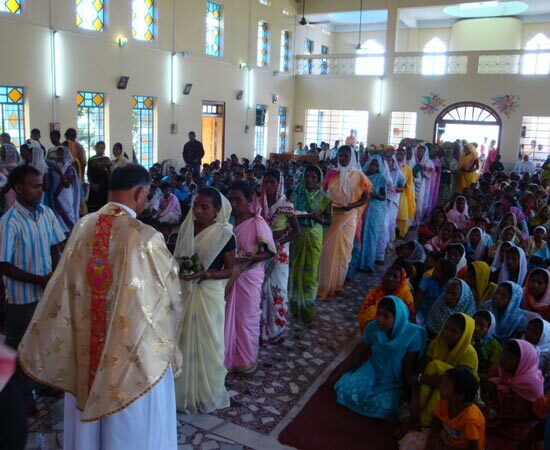 It was Fr Leo Piasecki, sdb, who reopened Dibrugarh Church work at the request of Msgr. Louis Mathias, sdb, on February 8, 1931. From 1934 to 1951 Dibrugarh formed part of the Diocese of Shillong with Msgr. Louis Mathias, sdb, and Msgr. Stephen Ferrando as its pastors. The Diocese of Dibrugarh was carved out from the Diocese of Shillong on July 12, 1951 with Rt. Rev. Orestes Marengo, sdb, as its First Bishop. In 1964 Bp Orestes Marengo, sdb, was transferred to the newly erected Diocese of Tezpur. On July 6, 1964 Rt. Rev. Hubert D' Rosario, sdb, was appointed the second Bishop of Dibrugarh. On his transfer to Shillong - Guwahati in 1969 Rt. Rev. Robert Kerketta, sdb, succeeded him on May 31, 1970 as the third pastor of Dibrugarh. When Rt. Rev Robert Kerketta, sdb, was transferred to Tezpur in December 1980, Rev Fr Joseph Variathukala, sdb, was elected as the Vicar Capitular. On July 13, 1981 Pope John Paul II appointed Rt. Rev. Thomas Menamparampil, sdb, as the fourth pastor of Dibrugarh. In 1992 when the Holy See erected the Diocese of Guwahati with Rt. Rev Thomas Menamparampil, sdb, as its bishop, once again Dibrugarh became vacant and Rev. Fr Sebastian Karotemprel was elected as the Diocesan Administrator. Bp Joseph Aind sdb, the first priest of Dibrugarh, was appointed the fifth Bishop of Dibrugarh on the December 23, 1994. Until 1964 the Diocese of Dibrugarh comprised the present-day Lakhimpur, Tinsukia, Dibrugarh, Sivasagar, Jorhat and Golaghat districts of Assam and Tirap, Changlang, Lohit and Dibang Valley of Arunachal Pradesh as well as the two states of Nagaland and Manipur. In 1964 when the Diocese of Tezpur was erected, Lakhimpur became part of that diocese. In 1973 the Diocese of Kohima - Imphal was erected with the states of Nagaland and Manipur. With all the eastern districts of Arunachal Pradesh, the diocese of Miao was erected on 7th December 2005. The Diocese of Dibrugarh now comprises of the five civil districts of Assam, namely, Tinsukia, Dibrugarh, Sivasagar, Jorhat and Golaghat.